If you’re using PolicyPak Browser Router -OR- you’re using PolicyPak File Associations Manager to make associations, you CANNOT also use the Group Policy or MDM method for setting default associations files, like what’s seen here. Underneath the hood, you are “fighting” with PolicyPak Browser Router and/or File Associations manager, like this. For PolicyPak Browser Router, PolicyPak Browser Router must “become” the default OS browser like what’s seen here. If PolicyPak Browser Router is not set as the Default Browser (automatically, using PolicyPak…) then you will get unusual behavior. For PolicyPak File Associations Manager, you must remove any Group Policy File Associations file for it to work reliably. 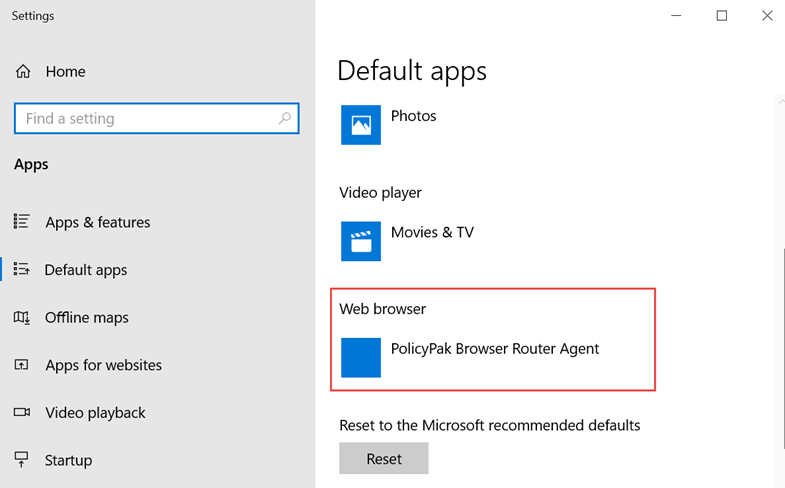 Summary: Use only PolicyPak … when using PolicyPak Browser Router and also PolicyPak File Associations Manager and don’t try to use a Group Policy or MDM File Associations alongside it.